It looks like the weather this weekend will be hot, perhaps very hot. Each team is advised to bring a gazebo or two for shade. We are ordering extra drinks so there should be plenty for everyone to buy as necessary from the refreshment stall. You are requested NOT to park in the surrounding roads, especially Station Road, as it is a bus route. Two years ago, the police had to be called to tow away a vehicle that was stopping a bus getting past - it cost the owner over £200. 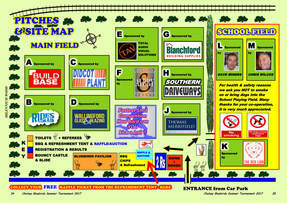 We use part of Cholsey Recreation ground as a car park, so there is plenty of space to accomodate up to 1000 cars. The entrance is in Station Road, and the car park is right next to our back field where we hold the Tournament - so very little walking. The cost remains at £3 per car which includes our full colour programme - this is in line with all other local Tournaments' car-parking charges. We thank you in antcipation of your co-operation. Thank you to the 186 teams that have entered our Tournament next weekend. The highest number we've had for a good many years - due to a late influx over the past 2 weeks, after the original closing date ! In fact, I've had to turn away nearly 20 further teams due to their age groups being full. It would be great next year to receive your entries in good time and not leave them to the last minute. I hate refusing, but with our 12 pitches and time factors, we couldn't hold many more than the 732 matches arranged for over next weekend. Dave Evans has now included all the fixtures in the Programme, and it will be off to the printers (ALBRY Print & Design in Wallingford) first thing tomorrow morning. However, if a team has made an inquiry and has indicated they would like to enter a team but haven't yet confirmed 100%, I sometimes give them the name TEAM X. Also, I sometimes put in a fictitious TEAM X to even up the number of teams in each group for a particular age, in the hope that I may receive a very late entry/inquiry. it could be that a "late" entry might become "TEAM X" - so worth giving me a call over the weekend or e-mailing me. See 2018 TOURNAMENT page for full details. Just a few spaces available in each age group - late entries by THURSDAY 17th AT THE VERY LATEST. Contact me immediately if wanting to join us for what is always, a wonderful and enjoyable day. ​My contact details are below. THURSDAY 17th MAY AT THE VERY LATEST. WE already have over 140 teams entered and last year we had another 30 late entries with a few more who were too late. Below are the maximum spaces left in each age group although it must be pointed out that if some age groups reach their maximum (24 teams), it will reduce the maximum for other groups. IF INTERESTED, please contact me immediately to avoid disappointment - thank you. Still arriving DAILY. ALL groups are at least 50% FULL with quite a few at 80% capacity. The maximum number for any specific age group is 24 teams. I hope to bring you more detailed numbers at the end of this week. Please don't leave it too late and be disappointed as I'm sure I'm not the only Club Tournament Organiser who usually receives a significant number of entries the week preceding the closing date & even more the following 2 weeks after ! OFFICIAL CLOSING DATE is THIS FRIDAY, 27th April. Fixtures are finalised on Saturday 19th May and inserted in the programme on the Sunday ready to go to the printers first thing on Monday, so the VERY LAST POSSIBLE DATE TO ENTER is THURSDAY 17th MAY. Any enquires after that, even if we have spaces, will have to be declined I'm afraid. See 2018 TOURNAMENT page for full details, info & downloads. I must apologise, but due to an oversight on the INVITATION LETTER, the following paragraphs were omitted relating to the younger teams using the 3 pitches sited on the adjacent Primary School Field to the main field - U7s, U8s & U9s. Cholsey Primary School kindly allow us to use their field which enables us to organise more games for the benefit of all the younger age teams. We ask you to respect the Council Schools’ policy of NO SMOKING and NO DOGS in the interest of all the children’s health and safety. 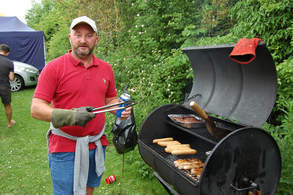 Although not to be encouraged, Smoking is allowed on the main field. Dogs also, are allowed on the main field provided (for obvious reasons), they are kept on a lead/under control. I'm sure you can appreciate we have to adhere to the Council's Policy on dogs and smoking and we hope it doesn't cause too much inconvenience to parents and supporters who may have been planning to bring their dogs with them. Arriving almost DAILY. - some groups are very close to being FULL - there will be a full update on the numbers entered for each age group on Friday 19th April - please don't leave it too late and be disappointed. They are coming in thick and fast now. Each age group is capped at a maximum of 24 teams although some groups may have to be limited to 21 teams. ​Don't leave it too late to enter - we hate to disappoint any club wishing to join us for what is probably one of the best organised Tournaments in Oxfordshire, perhaps the whole country. Don't take our word for it, just ask any manager/parent/player who has been to one. For entry forms, go to 2018 TOURNAMENT page by clicking HERE . Now only ONE PAGE left for advert (£60) or 2 half pages (£35 each). Another PRIZE added to the list at the bottom - scroll down. ONLY TWO PAGES left for ADVERTS. Have added extra donated prizes to list below - almost certain to receive a few more. The total value of the Prizes & Auction items so far is staggering . . . . in excess of £1600 ! I only have 3 pages left to fill in our full-colour Tournament Programme for advertising. Also, would love to hear from anyone willing to donate a PRIZE or an AUCTION ITEM for our Charity Raffle/Auction - share proceeds equally between the Bluebirds and The Thames Valley Air Ambulance. Donated £600 to TTVAA last year. See below under Donating a Raffle Prize or Donating an Auction item. To date, we have the following Prizes for the RAFFLE : Updating LIST as I receive them. I expect quite a few more by the time the Tournament comes around - perhaps as much as £1500 worth in total for all prizes. BIDS CLOSE at 6:30pm on SUNDAY 26th MAY at the TOURNAMENT. I will update any bids received on the page. The cost or running our Summer Tournament increases each year. We have deliberately kept our entry fees at £30 for a number of years as we feel this is a reasonable amount for Clubs to pay - this more or less covers the costs of our Trophies & Referees. 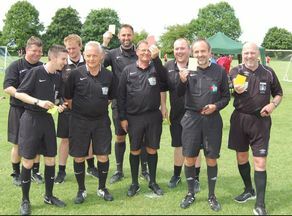 ​However, as our main fund-raising event, we always welcome sponsors in order to try to increase our overall income to purchase/replace equipment & team kits, pay referees' match fees throughout the season, pay for the upkeep of our Pavilion & insurance, and various other expenses - in total, well over £10,000 annually. We already have a number of Team Kit Sponsors and have 2 main sponsors for this year's Tournament - Thomas Merrifield & Miller Homes. We are very grateful for their support. 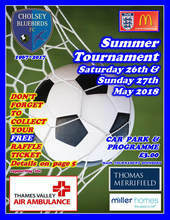 Also, at present, we have raised through advertising, nearly half the cost of printing our Tournament Programme, and would welcome any further interest from businesses, companies or even individuals. On top of that, we already have some items and sponsors for some of the cash Prizes in our unique Tournament Raffle & Auction, the proceeds of which are shared equally between our Club and The Thames Valley - raised almost £1200 last year, donating £600 to The TVAA - the previous year they received £500. Donating an Auction Item : last year we had a Drill, Sound Bar, Event Tickets, Attraction Tickets, Golf 4-ball vouchers, plus other items, all worth well over £50 individually with some valued at nearly £200 : depending on the value of the item, donor to receive half/full page advert.